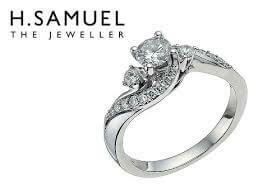 Shop luxury ladies’ jewellery with H Samuel voucher codes, and save on a variety of engagement rings, earrings and watches. Choose from diamond designs, gold gifts and silver surprises you can get the perfect accessory for a special occasion. This famous high street jeweller has been bringing luxury gifts to the UK for over 150 years. They now offer thousands of necklaces, watches, wedding rings and gifts for men and women, from major brands such as Armani Exchange and Swarovski. Whether you are looking to find the perfect engagement ring for your partner or a stylish new smartwatch to stay up to date on the move, you can enjoy savings across their range with our secret H Samuel discount codes. Some of their most popular collections include the Disney range, Chamilia Charms and Diamond jewellery. Whether you are looking for a premium ring or some affordable charms, use our free vouchers and save on your shop. Diamond Discounts: Find bargain prices on beautiful gifts when you shop by price. They have collections of diamonds and jewellery for under £50, and luxury gifts for under £20. With our H Samuel promo codes, you can get extra savings, especially during the holidays when their seasonal sales give you discounts of up to 50% off! So add some sparkle to your jewellery collection and save big. Mix & Match Deals: Our secret H Samuel discount vouchers are essential when you are shopping for a great gift or special ring. One of the best deals you can enjoy is the mix and match deals, where you can get 3 pieces of luxury jewellery for the price of 2. Enjoy a set of matching gems and save when you spend. Don't miss out on their 'Buy One Get One Half Price' bundles either! FREE Ring Sizer & Buying Guide: When buying an all-important engagement ring or wedding ring, sizing is very important. Before you make your purchases, make sure you check out their handy Ring Sizing guide, complete with a ring chart and free ring sizer. The ring sizer is easy to use and comes with full instructions; order online today. Newsletter: What's the best way to find out about the latest offers and newly launched collections? By signing up to their mailing list, of course. Receive emails straight to your inbox about stunning new jewellery pieces and great gifting inspiration, too. Even better. When you sign up to their newsletter, you'll receive all the latest deals and offers. Not only upcoming offers, but also a 10% off code to use right then and there on your next order. Sale & Last Chance Buys: If you're always seeking out a bargain, visiting their sale page is your best chance of finding something incredible at an even better price. Find seasonal sales, new deals and other great ways to save money on stunning jewellery items. With up to 50% off diamond ranges, watches and bundle deals. This is where to go to find the best money saving tips in one place. Also make sure you take a look around when they announce their Last Chance Buys. These items are usually dramatically reduced as they're in their final clear out. Save on everything from bracelets to earrings, cufflinks and so much more at low prices. Gifting & Engravings: If you're running out of ideas or want something extra special as a gift for someone you love, look no further. With a huge range of jewellery and gifting, there is something for everyone and in your budget, too. Find the perfect Christening present with necklaces and money boxes, or tankers for men. You can even use your H Samuel promotional codes to get discounts on personalising your gift with engravings and other alterations. Add that extra personal touch and make it even more sentimental. Free Gifts: Who doesn't like something extra with their order? Look out for their fantastic free gift deals. Spending a minimum requirement on selected brands and get a freebie slipped into your order, from tote bags to whole free charms. Ideal for when you are present shopping, it's the perfect addition to an already great gift, or even a little something for you to keep. You deserve it. Brands: As well as well known fashion and accessory brands like Guess and Calvin Klein, they also has some extra special collections from brands you'll love. Be enchanted by their Disney range, filled with ornaments and stunning silver charms of your favourite characters. Not for you? Their Harry Potter pieces are sure to put a spell on you, from Time Turner necklaces to Deathly Hallows earrings. Can you get Free Delivery at H Samuel? Save more with free 3-5 Day Delivery on orders from £49, and free Express Delivery on orders over £500. For orders under £500, get your order for £3.95 (£4.95 for Next Day) or enjoy free click and collect. Just order with our H Samuel free delivery codes and you order will be ready to collect in 4-8 days. Personalised orders can take up to 17 days to arrive. You can return your order into your local store for a refund, provided the purchase is in it’s original condition, for an exchange or refund. You also have the option to return your order via post in its original condition, ensuring you print out the Free Returns Label for free delivery. By choosing to click on this link and making your purchase on H Samuel through Myfavouritevouchercodes you are helping us raise even more money for good causes at no extra cost to yourselves as we donate 20% of our net profits to charity each month. With this simple click you have made a difference today and we thank you for your support.